Geoffrey Thomas Wright (No.15 in the list of male British team members) was born in Doncaster, Yorkshire, on 26th November 1924. By the standards of many skaters of that time Wright was a relative late comer to the sport having joined the National Skating Association in 1947 aged 22. The sport was regaining it's feet after a lengthy lay-off due to the Second World War and 12 months after Wright joined the NSA the World Championships resumed. 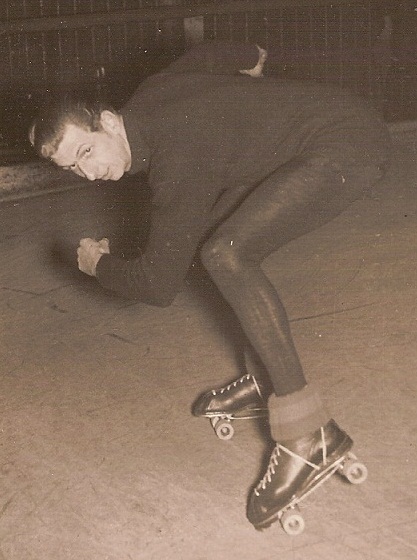 Wright was a member of the Bradford Roller Skating Club and was quite adept on rollers having also gained his 3rd Class badges in roller dance and international style roller figure skating. Coupled with his vast reserves of strength and power it was also this agility and ability that would see Wright quickly rise through the ranks of up and coming speed skaters. 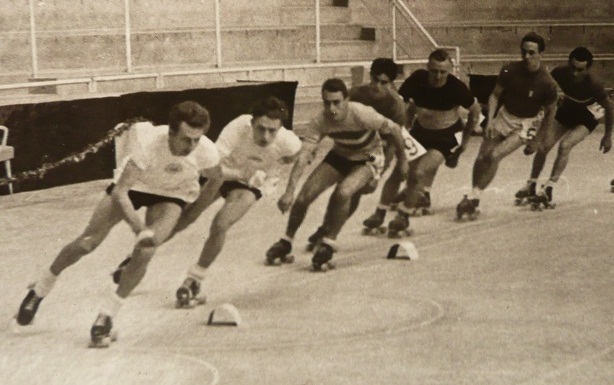 It's fair to say that roller speed skating had predominantly been confined to the Southern and Midland counties when it came to the major events and Championships with races being mostly held on either Alexandra Palace, the Birmingham Embassy, Granby Halls (Leicester) or Cricklewood prior to its closure in the late 1940's. However, some of the "lesser" rinks such as Herne Bay, Doncaster Lido or Rochester Casino would see competitions such as the Northern Counties or Midland Counties or even on occasion the Relay Championship held on them over the years. In 1948 the Batley rink went against the grain when it was selected to hold the Mens One Mile Championship, Five Mile Championship, Northern Counties and Relay Championship. Although the rink was some 30 miles away from Doncaster it was still considered "local" to Wright being a member of the Bradford club. Despite being on home turf Wright didn't feature much in these Championships, but a year later would see success for the Yorkshireman. In 1949 the Northern Counties were again held on the Batley rink and this time Wright showed everybody how good he was by winning the event ahead of K.C.Blakesley (Leicester). Unfortunately, just a few weeks after the race the Batley rink would burn to the ground leaving Wright and his team mates to look for other venues on which to train and compete. The recently opened Bradford Rollarena came to the rescue despite now being almost 40 miles away from where Wright lived in Doncaster. In 1950 the Northern Counties was again held in the north, this time on the Bradford Rollarena itself. Defending Champion Wright could only manage second to Leicester's Ken Law but in 1951 he regained his Northern Counties title, again the event being held on the Bradford Rollarena. Despite these victories the three Counties Championships (Northern, Midland and Southern) were seen as lesser events. Obviously they were still achievements but the main accolade was to win a medal or an outright title in the British Championships. This was something that still eluded Wright and the next few years would see him have a relatively lean period. Being a skater from the north in the 1940's and 1950's was not ideal in terms of competing. The northern skaters had little by way of competition and with many of the major events being held in London it was often difficult to attend. Public transport wasn't easy to come by and making your own way to the southern venues could sometimes incur quite hefty costs. Motorways were as yet unheard of and cars unreliable to say the least. It was not uncommon either for those skaters that managed to venture south to stop overnight due to the length of time it might take to travel from one end of the country to the other. Because of this Wright often only featured in the main British Championship events and kept himself in contention by regular hard training, often on a bike and club races. On 6th March 1954, Wright made the trip down to London to skate in the British Five Mile Championship on the Alexandra Palace rink. He would not come home disappointed. Wright made the final and was narrowly beaten by the two Broadway skaters of Roy Parsons and Denis Hill. By now the Cricklewood rink had closed down and Parsons and Hill were using the Alexandra Palace rink as their home rink, sharing it with the Alexandra Palace and North London Speed Clubs. This made Wright's third place all the more remarkable when you consider that much of the opposition shared the same benefits as Parsons and Hill. Three weeks later and he was back on the podium again, this time with his Bradford team mates who would finish second in the British Relay Championship. These medal winning performances along with an excellent performance in team trials saw Wright get selected to represent Great Britain at the forthcoming World Championships in Bari, Italy, making him the first "proper northerner" to represent his country. The World Championships were in October and Wright was selected alongside Alan Cattee, Ken Rawlings and arguably the most prolific British speed skater of the time, multiple British Champion and World medallist, Denis Hill. The indoor track at Bari was a hard slippery surface that vibrated through the feet due to the joins between the tiles and was not to Hill's liking. For Wright, however, he had no trouble at all and would skate all four distances over the two day competition and be the highest placed British skater in all events. In the 20000 metres Wright managed to put in an even more outstanding performance and secure a superb bronze medal just behind Italian legends Loriano Lori and Luciano Cavallini. 1955 was to be an even more successful year domestically for Wright. On 23rd January Wright won his first individual British title, the One Mile on the Bradford Rollarena. Of course, he had the home advantage but for those who thought he couldn't repeat the performance elsewhere he proved them all wrong a month later when on 26th February at London's Alexandra Palace he added the Five Mile to his Championship tally. Wright was certainly the man of the moment. A week after that it was back to Bradford where he won the Jesson Cup One Mile Open Handicap Championship off scratch, and then a return to Alexandra Palace to again cement another second place in the Relay Championship with his Bradford team mates. Unfortunately for Wright, in 1955, the year he was at his absolute best, there were no World Championships. After Bari it would be a full 2 years before another World Championships were held. 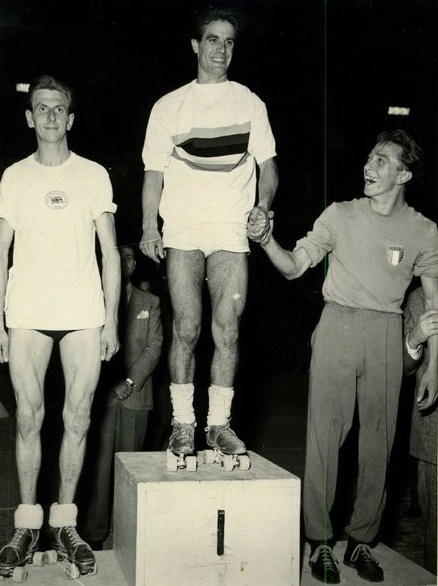 The 1956 domestic season was lean by Wright's own standards as he failed to take a medal of any colour in the British Championships. Despite this he was still selected for the World Championships to be held in October in Barcelona, Spain. This time, however, he would only be entered into two of the four events, the 10000 metres and 20000 metres but once again would come home with a medal - a silver in the 10000 metres along with a commendable 5th in the 20000 metres. Even at the age of 32 Wright was showing the world that he was still an elite skater. 1957 was again a lean year domestically for Wright, although he did regain his Northern Counties title in April on the Birch Park rink in Manchester. Like 1955, there were no World Championships for British skaters, but unlike 1955 it was a decision taken by the British federation and not the world governing body, FIRS.. 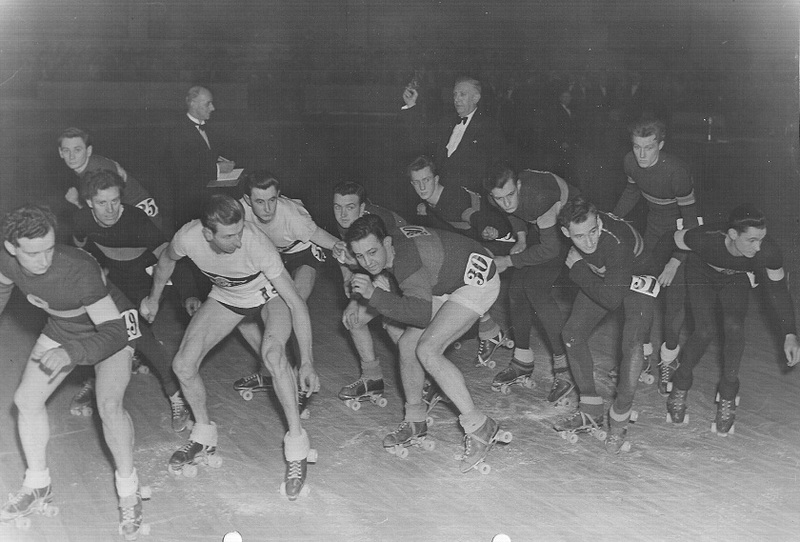 The World Championships in 1957 were held on the road in Palermo, Sicily but the National Skating Association dictated that having no suitable training venues, the short notice of events being held and the expense to send a team, Britain would not be represented. It was yet another blow for British skaters and the evergreen Wright. By 1958 Wright knew he hadn't many more years left at the top in the sport. Throughout the winter of 1957 he had trained as hard as he had ever trained and early the following year was once more a force to be reckoned with. He had already finished 2nd in the Northern & Midland Counties Championship (the Northern and Midland Counties races had now been joined as one event) in November, but on 22nd March 1958 he again made the trip south to the Alexandra Palace rink and again was victorious in the British Five Mile Championship. Later that year he was selected again to put on a British shirt once more and take part in a World Championships, this time in Finale Ligure, Italy. His first (and last) time on a road circuit. Wright again skated all four distances with his highest place being 9th in the 20000 metres, the highest of any other British skater in that event. In 1959, though, Wright knew that his time at the top was coming to an end. The British team now had a nucleus of young talented skaters such as Danny Kelly and Leo Eason who would both go on to win World titles, and the ever present Les Woodley who would win world medals and smash the then record books with his tally of 12 British titles. Wright was 34 and whilst he was still in amongst it he was not the skater he once was. His last major medal was 2nd place in January 1959 in the Northern & Midland Counties Championship at Granby Halls, Leicester, just behind Les Woodley. Just behind Wright was another up and coming youngster, Ricky May, who was also on the rise and would also go on to be a world medallist. All around the Bradford skater was youth and talent. With no World Championships again in 1959 Wright philospohically looked back on a successful personal skating career that had spanned a decade and decided to call it a day. Although a Life Member of the National Skating Association, Wright was seldom seen around a rink after his retirement but still maintained a keen interest in the sport and was not averse to writing the odd letter of support to later generations of British international skaters. Out of the ashes of his Bradford (and latterly New Bradford) club came the Leeds Roller Speed Club, with the likes of Derek Unsworth and Pete Hawksworth competing for the northern team and who regularly held the Geoff Wright Cup event in the late 1960's and early 1970's - a trophy donated by Wright himself. 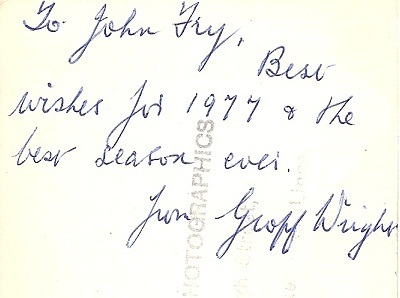 Sadly, Wright passed away in 1992. Having been thought of as an "old" skater when he was competing, his passing aged just 68 was considered "young" for such a fate. Geoff Wright may not be a name that is at the forefront of people's minds when we talk about great British skaters, but that doesn't mean to say that he wasn't one. He was very selective in the events he competed in domestically, but generally it was circumstances not dismissiveness that dictated this. Circumstance tended to play a major part in Wright's skating career not only domestically but also internationally where three of the years he was on form there were no World Championships for him. Wright was a relative late comer to the sport and despite his years he still managed to compete and be successful at the very highest level, taking on and oten getting the better of the younger skaters of that time. He was never a sprinter, he was a distance man. His performances will tell you that. With three British titles to his name, two of which being the Five Mile, as well as a silver and bronze medal in World Championships, Wright was one of those that produced winning performances when nobody really expected him to. And it is for that determination and subsequent success against adversity that he deserves a place on this website as a British Skating Legend.